Designers have tried every trick imaginable to create the perfect alarm clock. It has to be easy to use, loud enough to wake us up, and – most importantly – hard enough to turn off in the morning that we can’t simply slap the “snooze” button and then go back to sleep for a few more hours. The Sub Morning alarm clock is a concept created by Kim Min Jeong that definitely has that last part perfected. 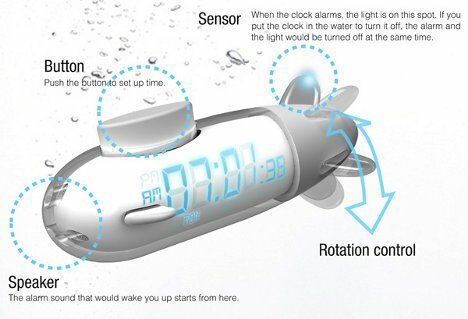 The submarine-shaped alarm clock looks like just a cute bedside clock until the appointed time in the morning. When the time reaches the appointed moment, the clock begins making sounds and flashing its little light – and it won’t shut off until you completely submerge it in water. For most of us, that means picking up the clock, carrying it into another room, and filling up a sink with water. It isn’t easy to go back to sleep after all of that action (not to mention dunking your hands into water), so maybe we’ve finally met the perfect alarm clock. See more in Clocks & Watches or under Gadgets. August, 2012.